AUD is under pressure due to the US and North Korea issue. The US is publishing some economic reports such as Core Inflation Rate YoY and Inflation Rate YoY. The support rests at 0.78190 with resistance at 0.78890 which both lines are below the weekly pivot point at 0.79540. The EMA of 10 is moving with bearish bias along the descendant channel and it is above the EMA of 200 and below the EMA of 100. The RSI is moving in oversold area, the MACD indicator is in negative territory and the Stochastic is moving in low ranges. The ADX is showing weak sell signals. The price is below the Ichimoku Cloud and above the Chinkou Span. The Tenkan-sen and the Kijun-sen are both showing a horizontal trend. 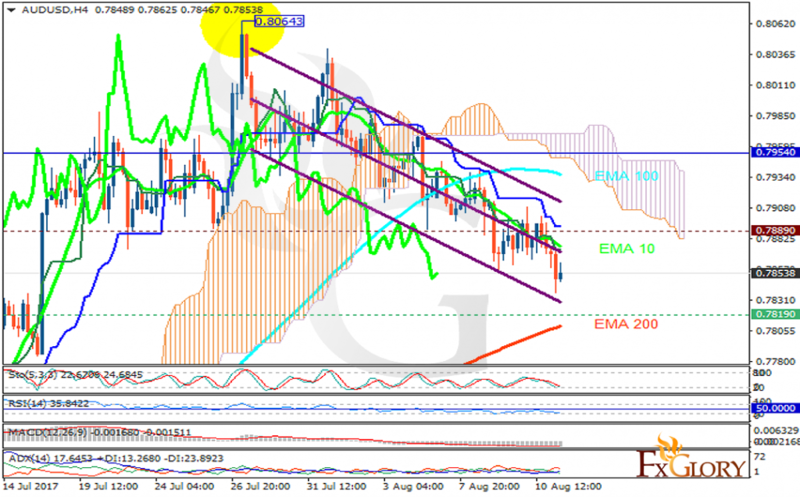 If the bears stay in control, the price will drop towards 0.7750 otherwise it will grow to 0.78970.